The Report on International Exchange Activities for the Performing Arts is an annual report that presents the current state of domestic and international performing arts groups and their exchanges through statistics and in a guide format. This survey offers an overview of international exchanges in the performing arts sector—its dynamism as well as any growth trends. 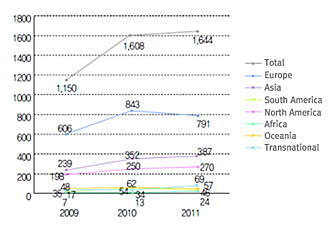 The count for the international activities of domestic performing arts groups in 2011 came to a total of 830. 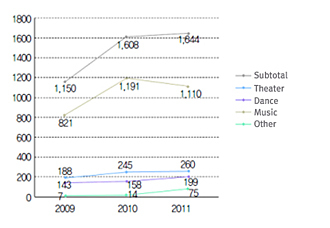 The total count for the domestic activities of international performing arts groups came to a total of 1,644. The number of domestic performing arts groups who engaged in international activity was 264, showing a decrease from 2010, but the number of performances, at 830, demonstrated a 16.1% increase from 2010. On the other hand, the number of international performing arts groups that performed in Korea came to 939, showing a 2.2% increase from 2010. 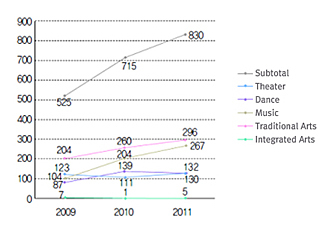 Examining the international exchange activity of domestic and international performing arts groups by genre, it’’s possible to observe that the international activity of domestic groups increased by 30.9% from the previous year (2010) in the genre of music, affecting the upward trend seen in the total. On the other hand, the domestic activity of foreign musical groups decreased by 6.8% from the previous year, leading to the visible decrease of activity in the total. 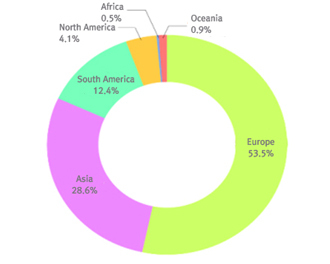 The characterizing feature of the international activity of domestic performing arts groups in 2011 was that the number of North American performances decreased while simultaneously increasing in other continents in a consistent upward trend. 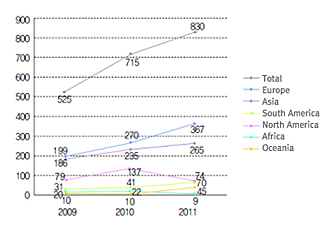 The increase in performances in the Oceania area in 2011 is particularly noticeable. This trend can be attributed to the 50–year anniversary of South Korea–Australia relations and the resulting commemorative events and spike in the overall number of cultural exchanges. The activity for international performing arts groups performing in South Korea increased except for those from Europe, which showed a 6.2% decrease from the previous year. Out of the 264 domestic performing arts groups that performed internationally in 2011, 130 ventured abroad via festivals. This subgroup participated in 147 festivals and performed a total of 217 times, making up 26.1 percent of the total number of performances. In all, 116, or 53.5%, of these festival performances were at festivals in Europe. On the other hand, out of the 939 international performing arts groups that performed in South Korea, 563 groups participated in 108 domestic festivals, with 48.9% of these festivals based in Seoul.